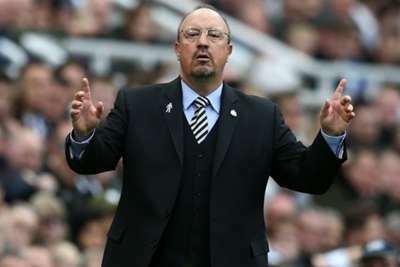 Newcastle United manager Rafael Benitez remains convinced his side will avoid relegation despite Saturday's 1-0 home defeat by Brighton and Hove Albion consigning them to a seventh Premier League loss in nine games. Benitez's men controlled much of the possession at St. James' Park, but they struggled to craft chances and were punished when Beram Kayal deflected Jose Izquierdo's shot into the net before the half-hour mark. Fans voiced their frustrations at the performance and many headed for the exits before full-time as Newcastle were left rooted to the bottom of the table with just two points, three adrift of safety. Benitez is still optimistic about their chances of escaping the drop, however. "Everybody is a bit down," the Spaniard told reporters. "We have lost a game we deserved to win or at least get something. "It is difficult to explain when you have these situations. The way we attack and control, we had the chances. "I've said before it would be difficult and it is still difficult, but it is a long-distance race. "We have to keep going and make sure we maintain this level and score goals. I am still convinced [about avoiding relegation]." Victory for Brighton saw Chris Hughton defeat his former side, and he took particular pleasure in seeing the Seagulls register a first win on the road this term. "It was a win that's been a long time coming so it's massively satisfying," Hughton said. "There are different ways to win a game away from home and you always have to earn it – we were up against a good side who had a lot of possession, so we had to defend really well. "We've made lots of blocks and good saves – we had to be resolute. What you need is to have defenders who're ready to get their head onto the ball and block the chances and we had that this afternoon."